StatsBee is a high-performance metric agent written in C++. It can ingest multi-thousands of tagged metrics per host and support global percentiles out of the box. 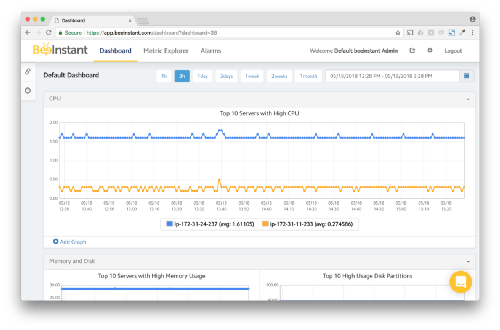 Metrics can be custom metrics published by StatsD clients or infrastructure metrics (cpu, memory, network, mysql, postgresql, mongodb, nginx, apache, docker containers, etc.) from CollectD or Telegraf. StatsBee is a drop-in replacement for StatsD daemons, Graphite and InfluxDB. When logging in for the first time, you will be welcomed with a popup that contains a command to install StatsBee to Linux 64 bit hosts. You can also retrieve this command from the top-right menu Settings > Account. public_key and private_key can be retrieved from https://app.beeinstant.com. If you install StatsBee directly into a Linux 64 bit host, you will receive host metrics by default: CPU Utilization, Memory, Disk, Network. These metrics will flow into the default dashboard. You can also search for these metrics in Metrics Explorer. Tagged metrics natively. StatsBee can handle thousands of uniquely tagged metrics per host with ease. Global percentiles are built in by defaults. You can access to percentiles 99.99, 99.9, 99, 95, 90, 80, 70, 60, 50 aggregated in real-time across multiple-thousands of hosts. Drop-in replacement for StatsD daemons, Graphite, InfluxDB.